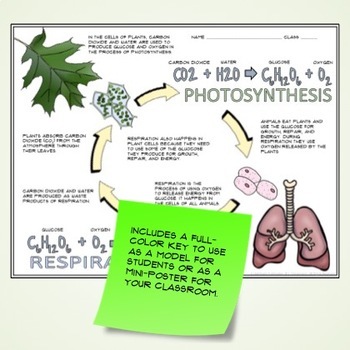 Use this resource to enhance your teaching about photosynthesis and respiration. Or use it as part of your lesson about conservation of matter! Guided graphic notes are a great way to help your students make associations between words and visual images. Sketching, doodling, or coloring notes gives students an opportunity to personalize their learning and improves their retention of the things they are learning. Research shows a powerful memory effect when images and words are linked during the process of learning. • Fill-in-the-blank notes for students who need some guidance with note-taking. • A completed handout for students who have been absent or who have disabilities that prevent them from taking written notes. • A blank notes page with all illustrations but little text. Use these if you prefer developing your own notes, or for students who are ready for taking notes without assistance. • A full-color teacher key that would also make a great mini-poster for your classroom. Total of 4 pages - 3 black and white and 1 color. This FREE set is a sample of the layout, design, and quality of my other sets. See all of my Guided Graphic Notesby clicking on the green link. • Please go to your My Purchases page (you may need to login). Beside each purchase you'll see a Provide Feedback button. Simply click it and you will be taken to a page where you can give a quick rating and leave a short comment for the product. I value your feedback. It helps me to make resources that meet your needs. • Look for the green star near the top of any page within my store and click it to become a follower. You will then receive customized email updates about my new products.